Investment banking is notoriously stressful and women, still being in a minority when it comes to leadership roles, face extra challenges. So I was really pleased to be asked to come in to facilitate a bespoke wellbeing at work workshop for the Brentwood office of Bank of New York, Mellon. They wanted to show support for the women in their office (men were welcome, too) by promoting self-care and stress relief to mark International Women’s Day, 2014. I put together an outline that encompassed some psycho-education around what happens to the body and brain when we get stressed along with some breath work, some bodywork to help them honour the fight flight impulse in appropriate ways (rather than doing what so many of us do and suppressing our stresses until they potentially make us ill), using mindfulness of body and breath to improve mood as well as some life coaching and NLP tips around scheduling and time management. I also ensured there would be time for sharing as, ultimately, it’s about their experiences and they know their worlds better than anyone. This was approved and I delivered the workshop I’d outlined. The organisers had created a friendly safe space and participants felt able to safely share some of their experiences around their biggest stresses and what helps. While they were all open to experimenting with the different tools, I think the sharing alone was beneficial as some seemed to realise for the first time that they’re not alone. The British Association for Counselling and Psychotherapy (BACP) is one of the best respected professional bodies for counsellors and psychotherapists in the UK. As a psychosynthesis counsellor and coach-therapist, I’m an accredited and registered member myself. Since March 2014, I’ve served on BACP’s Coaching Executive. First as their Specialist for Communications and, from January 2017 to November 2018, as Chair. I was asked to share some ways to help therapists and coach-therapists better support themselves (and, as a knock on, their clients) so put together a proposal. Drawing on my various holistic therapies (including psychosynthesis, life coaching, NLP, EFT, coach-therapy, yoga therapy for mental health and even, for those who wanted to at the end, crystals), I outlined a bespoke workshop to support professionals who spend their working lives being there for others. It was chosen as one of the conference’s Self Care Strand workshops. Initially expecting about 25 people, I was later asked if more would be acceptable so I adapted the workshop a little. I wanted to share as many self-help tools as possible while holding the space for a larger number. On the day of the main conference, 48 people attended my self-care workshop. They were a lovely, open group, happy to experiment with different mind, body, heart and soul techniques. 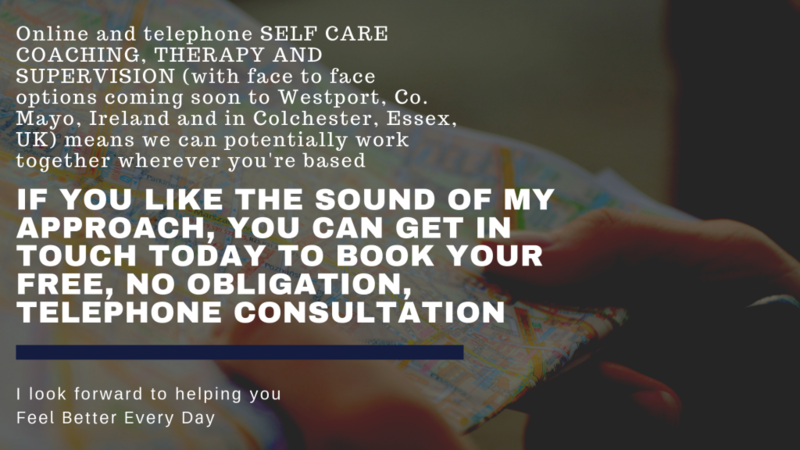 As with so many caring professionals, understanding the benefits of their self-care for others seemed to help motivate many to prioritise their own wellbeing that bit more. My 90 minute workshop came at the end of the first day and some of the relaxation offered a way for participants to wind down a little before the majority headed home (some stayed on for BACP Coaching’s Day the next day). ‘I would once again like to thank you for being part of our BACP Practitioner Conference,’ said BACP’s Events Organiser, Jade Ingham-Mulliner. AgeUK Lewisham got in touch wanting me to help some of their staff better manage the stress involved with looking after a vulnerable population. I put a proposal together outlining potential workshops lasting a day, half a day or 90 minutes. They opted for the half day workshop and I went to south London to work with the small team. As well as some psychoeducation around what happens to the body and brain when we’re stressed, I shared several self-care tools, also facilitating a space for them to share with each other. They were already a cohesive team and were willing to experiment with a wide range of tools including some NLP (Neuro Linguistic Programming), EFT (Emotional Freedom Technique), yoga and mindfulness.